Listening to the radio today on my way to lunch with the family, I decided to call my old friend Mark. "Do you realize that we're getting old and our bodies and minds are failing us at an alarming rate?" "Well, I'm listening to a Wham song on the radio and singing along and I can't remember the name of the song." "Well, yea! I used to be able to name any song that came out in the 80's and now I find myself forgetting them all the time, despite the fact that I can still remember the words." "Oh, that's right," he said, "You never did drugs..."
Your old friend Mark used to do a Wham! cover band thing with his bro at a nightclub in St. Pete on weekends. 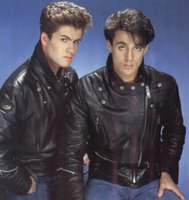 Mark was the George Michael guy.